How much memory does your PHP script use? 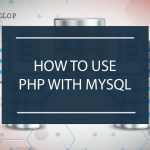 Memory efficiency is not among the first things to learn about PHP, but checking how much memory a PHP script is using can be very useful. 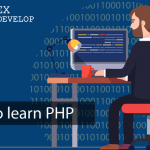 Learning about memory and code optimization is also among the steps I recommend in my free guide to become a better PHP developer. 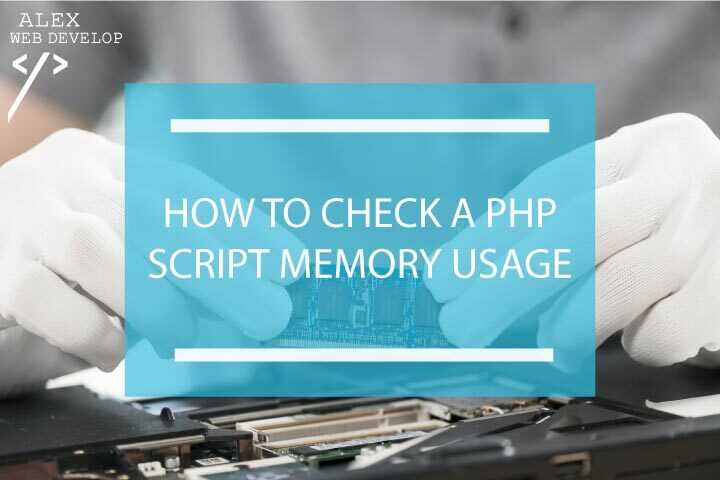 Keep reading to learn how to check your PHP scripts memory usage and to see some specific examples. Among web applications requirements, memory efficiency is not usually at the top of the list. And, generally speaking, that’s fine. 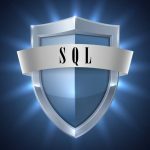 Other factors, like SQL security and authentication good practices, are surely more important. However, excessive memory consumption can be a real problem. In fact, memory consumption issues can easily lead to crashes, hard-to-find bugs and even open the door to Denial-of-Service attacks. This is especially important in high traffic websites, where many concurrent script executions occur and it’s easier for memory-related issues to cause problems. always-on scripts like PHP daemons. Of course, memory issues can occur in other kinds of script as well. But how can you check how much memory your script is using? 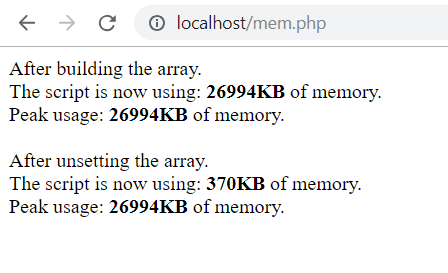 the standard PHP library provides you with two functions that give you that exact information: memory_get_usage() and memory_get_peak_usage(). memory_get_usage() returns the number of bytes used by the script when the function is called. Similarly, memory_get_peak_usage() returns the maximum amount of memory (again, in bytes) used by the script until the function is called. 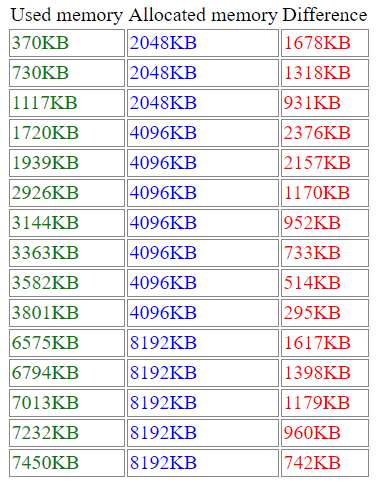 As you see, after the array is unset the current memory usage goes down to 370Kb, but the peak usage remains the same. (If you want to learn how to set up a local PHP environment, see the Getting started chapter of my PHP learning program). Both functions take an optional boolean argument named $real_usage. Its default value is false. What’s it’s meaning and when should you set it to true? $real_usage is a boolean argument. Its default value is false for both memory_get_usage() and memory_get_peak_usage(). If this argument is set to true, then the function returns the full amount of memory allocated by the PHP interpreter for the script instead of the memory actually used by the script. The PHP interpreter dynamically allocates memory for the script. This memory is allocated in chunks, small pieces of a fixed amount of memory. When all the allocated memory has been used by the script, the interpreter allocates another chunk. Therefore, the amount of allocated memory is always a bit bigger than the amount of used memory (how much bigger depends on many factors, including the PHP configuration and the operating system settings). If $real_usage is set to false (the default), then the functions return the used memory only. If $real_usage is set to true, then the functions return the whole allocated memory. Notice how the used memory (the first column) grows gradually, while the allocated memory (the second column) grows in chunks. if you try running this example and get strange results, like the allocated memory being smaller than the used memory, it’s probably because of some caching system. A way to avoid such problems is to restart the web server right before running the script. When should you set $real_usage to true? if you want to see how much system memory your script is using, then you should set $real_usage to true. Because the allocated memory, even if it’s not actually used by the script, is still reserved for it and isn’t available for other system processes. In other words, it is the amount of system RAM reserved for the PHP process. On the other hand, if you want to profile your PHP script, then it’s better to leave it to false because you will see the memory usage in more detail. In fact, that way you can see how much memory a specific piece of code is using regardless of how much memory is available to the script as a whole. Let’s see a couple of examples of how to do this. Inside loop structures excessive memory usage can lead to problems, especially if this usage keeps growing after each loop iteration. If you want to make sure a loop isn’t using too much memory, it’s a good idea to profile it. To begin with, you should print the memory usage before and after the loop to check the difference. If you see that the memory usage is too high, then you should also check inside the loop itself. The $real_usage parameter is better left to false, because you want to profile your code in detail more than your whole script. It’s also useful to see how much of the maximum available memory is being used. 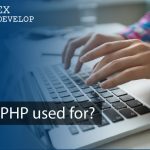 A PHP script can use only up to a certain amount of memory. This value is set in the memory_limit variable of the php.ini file (the main PHP configuration file). You can retrieve that value with the ini_get() function, convert it into bytes and compare it to the script’s memory usage. PHP daemons are never-ending, looping scripts. They are extremely useful for maintenance and monitoring tasks, like automatic email notification systems and maintenance operations. Just like any always-on application, PHP daemons too can suffer from memory leaks. A good practice is to check the memory usage at the beginning of each loop and do something if it turns out to be excessively high. For example, you can kill or pause the daemon and send a notification email (you will see how to do it in the next chapter). For this purpose, it’s better to set $real_usage to true, because you are now more interested in how much memory is really been used more than in profiling your script. Of course, should memory issues occur, you will need to carefully profile the script to see where the problem comes from (for that, it will be better to leave $real_usage to false). You can also stop the daemon when its memory usage goes beyond certain percentage of the maximum allowed usage. To do this, you need to compare the memory usage to the memory_limit value, just as you saw in the loop example before. Sometimes, debugging and profiling a PHP script’s memory usage can be difficult. It’s not always easy to retrieve the output from memory_get_usage() and memory_get_peak_usage(), especially when the memory usage depends on the request string values and other factors. In some cases, memory issues may arise only under specific circumstances or only after some time (especially in PHP daemons). Just echoing the memory usage isn’t always good enough. You can’t just stare at your screen waiting for a memory leak to happen, right? One solution is to log the memory usage information to a log file or a database. But this solution isn’t perfect either, because you will end up with tons of logs that you need to read and manage. A smarter solution is to make PHP do the hard work. Instead of printing or logging everything, just check whether the memory usage is too high. If not, continue the script execution. Otherwise, send yourself a notification email together with useful debugging information. This simple procedure removes the need for you to actively check your scripts. So, how can this be done in practice? Let’s go back at the daemon example. Now, before killing the script when the memory usage is too high, we send an email so that we know that this script has been terminated. We also attach a file with the debug back trace and one with all the defined variables to make easier for us to debug the issue. NOTE: you need to install PHPMailer first. 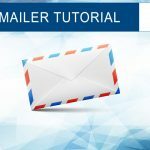 Follow my PHPMailer tutorial to learn how to do it. they do NOT take resources into account. The system memory for these types is not handled by the PHP core engine itself. It’s the external library that does that. Therefore, memory_get_[peak]_usage() does not include it in its result and you need to retrieve it in some other way. The solution you find in the above post works on Linux systems only. Now you know why it’s important to keep your scripts memory usage under control, and you know how to do it. You learned the difference between memory_get_usage() and memory_get_peak_usage() and what the $real_usage argument really means. You also saw how to include external resource types in the calculation, on both Linux and Windows systems. how much memory is the last PHP script you wrote using? Go check it and tell me in the comments below! If this tutorial has been helpful to you, please spend a second of your time to share it… thanks! Hi Alex could you add an example about checking the percentage of memory_limit that has been used? I think it’s useful for shared hosts. Sure, I’ll update the tutorial as soon as possible. Hi T-900, I’ve just updated the loop and PHP daemon examples with the memory_limit percentage. Hi Jon, if you found an error I’ll be glad to fix my script. Could you please tell me what’s wrong? You’re printing $mem_usage two times, it should be $mem_full_usage for the second echo command. You’re right leo, the second echo should print $mem_full_usage indeed. I fixed the code. Thanks!